Parks4Pups is pleased to be the founding organization for the first off-leash dog park in North San Luis Obispo County built in March 2005. 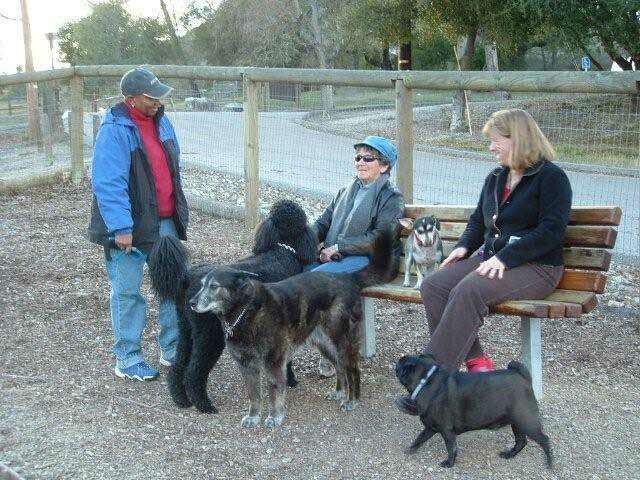 Heilmann Dog Park in Atascadero is ideally located for North County residents and visitors to our community. The site is about 3/4 of an acre in size with a gentle slope, convenient parking, restrooms, a doggie “spa”, water, and wonderful views. The park is securely fenced and equipped with water, trash, mutt mitts, and five picnic tables with umbrellas and five park benches. Bricks are installed at the entry gates and also around the water area which is now a pleasant and relatively level place to sit and watch the dogs frolic. The weeds and noxious plants are gone and the park is covered with an assortment of wood chips and mulch. There’s a nice pathway that connects the two entry gates to the park benches for visitors who are not sure-footed. For landscaping, the park is graced with wine barrels planted with seasonal flowers, shade trees, lots of native plants to create a pleasing space for everyone. Be sure to check out the kiosk for information on park events. Your cash donations are critical to help maintain this beloved park.